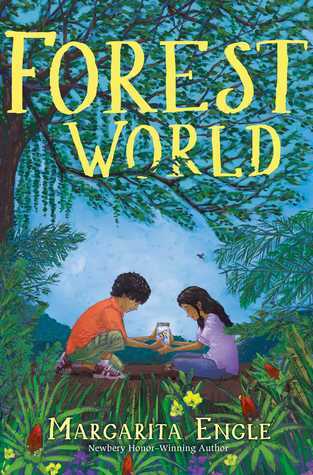 Cuban-American poet, Margarita Engle, tells the story of a pre-teen sister and brother, reunited in Cuba in “Forest World” (Atheneum 2017). When the siblings were quite young, their mother fled Cuba to America by raft with her infant son Edver, leaving behind Luza with her father in their Cuban rainforest home. Now she’s sent Edver to Cuba to meet relatives he doesn’t know. He didn’t even know he had a sister. Luza, a year older remembers the dramatic exodus and has suffered, wondering why her mother deserted her. Luza, with her father and grandfather, protect a patch of endangered rainforest against poachers and destroyers. Her spoiled American brother, without his customary internet hookup is bereft. Here is an eco-adventure with a juxtaposition of technologies and cultures along with the reuniting of a family divided by 90 miles of ocean and laws that have kept them apart. Edver, like his scientist mother, thinks like a scientist. He’s smitten with wonderfully gross oddities in nature. “The wasp injects poison into a roach’s brain,/ turning the bigger insect into a zombie,/ that can be ridden like a horse/ using the antennae as reins,/ until they reach the wasp’s nest,/ where guess what, the obedient roach/ is slowly, grossly/ eaten by squirming/ larvae.” The siblings’ love of nature will draw them together, in spite of their vastly different cultures and economic status. Edver has strict orders from Mom not to show off, eat too much, or compare American grocery stores to the meager rations that Cubans are allowed. Oh yeah, and the siblings set into motion an eco-disaster, in their attempt to draw their mother to the island. And now they must solve the crisis or more species and habitat will vanish. Read this insightful verse novel by this year’s Young People’s Poet Laureate.